Having a good hairdo is an important part of anyone’s day, that is unless you don’t have any hair. Those of us that do want to ensure it looks great all day long and part of achieving that goal is finding the right hair stylist to do the job. There are some key tips that can help to ensure you pick the right stylist for your hair. Our first tip is to ask those around you for their recommendations. A hair stylist is kind of like a doctor, you want to find one that you trust to do the job correctly. Your close friends or even coworkers should have a few suggestions for you to try out. If you don’t have any people that you feel comfortable asking, you can always opt for doing some research of your own. There are many online review sites that you can look at to find salons in your area. We encourage you to read through all of the reviews for each stylist to see what others are saying about their work. A simple search like ‘ salon in Miami Beach ‘ can return a number of potential stylists for you to check out. Most individuals are unaware of the fact that stylists looking for new clients will typically offer complimentary services. These services may include a free consultation, bangs trimming, and other salon treatments. It’s important to look out for the details about specific days that these services are offered to new clients when searching online. You can always call the salon and ask about these services as well as any restrictions to ensure you get a correct answer. Another great way to find the perfect hairstylist for your hair is to do some checking on social media. A great benefit of using this outlet when finding a stylist is that most typically post their work on their fan pages. This will allow you the opportunity to realize if you mesh with the stylist’s style before even booking a consultation. Also, you can usually find comments from customers about the stylist’s jobs and abilities. Social media makes it really easy to get all the information you need about a stylist in one simple place. One of the last ways you can find a hair stylist in your area that is looking for more clients is to read the local newspaper advertisements. Yes, these still exist. 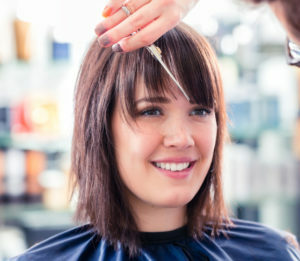 In fact, many salons will still run promotions in the newspaper and local magazines in hopes of attracting new clients. Many will even offer discount coupons which can help to decrease the cost of your first salon visit. Finding the right hair stylist can seem like a monumental task at first, especially if you are leaving a hair stylist you currently love. To make the process much easier you should utilize the many tips we provided above. It pays to do your research, so don’t be afraid to utilize multiple methods to ensure you find the right fit for your hair needs.